I absolutely fell in love with Danielle Flander's card this week at CASE Study and just had to make a stab at it. I decided I wanted to use this pretty Hero Arts Circle Doily, so I chose some Tide Pool layering paper as my card base and white embossed the doily off the edge. Then I made my little frame using a piece of paper from Echo Park's Happy Days pad and a Spellbinders Labels Eighteen, and stamped my sentiments from Simon's exclusive Flower Friends set. My embellishments are both Martha Stewart: a hydrangea sticker, and her punched butterflies. I'm pleased with the way this turned out! Thank you, Danielle, for your wonderful inspiration! Welcome to our last challenge of the month at the Simon Says Stamp Wednesday Challenge Blog, which is traditionally an Anything Goes challenge. This year we're adding a little twist to each of these challenges, asking you to add a certain element - this month we'd like you to add pearls to your creations. The design team are using Bazzill products. I chose this beautiful pad of Bazzill papers called Vintage Marketplace and made 2 cards today. I pulled out 5 of the papers and used a sketch to combine them, along with Simon's exclusive Happy Every Day stamp set and some bright pink pearls. I fussy cut out the roses from 1 of those papers and popped it up below my sentiment. This one uses 2 more of the papers, paired with Simon's Circle on a Line die, and the roses and sentiment from Simon's Best Mom Ever stamp set, plus more of those bright pink pearls. Heidi is providing another $50.00 gift voucher to the Simon Says Stamp Superstore for the lucky random winner of this challenge - will it be you? I have been entranced by the Bokeh style of photography and thrilled to see it spilling over into cardmaking. It occurred to me that the Simon stamp set called Lots of Dots is perfect for playing with this style. So I pulled out some inks in aqua and added a few greens, chose 4 of the solid circles in the set and stamped away. Inks are Hero Arts Mint Julep, Soft Pool, Pool, Tide Pool, Splash, and Green Hills and I added my Simon's exclusive Green Apple to the mix. (the card base is also that same color). So far, this is my favorite color from Simon! I used one of my favorite sentiments, from Ali Edward's Simply You. To give the ethereal look that bokeh has, I then covered my stamped panel with a piece of vellum before attaching it to my card base. Unfortunately the vellum doesn't lie completely flat, so the sentiment was almost too muted to read, and so I went back in and overstamped it onto the vellum. Then I added the perfect sequins from Lawn Fawn's Into the Woods collection. I love how this turned out, and making it gave me a little foretaste of spring! Thanks for visiting me today - hope your week is off to a great start! Thanks for visiting me today - have a wonderful week! 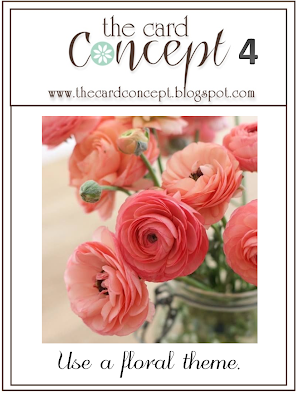 This week the ladies at Card Concept have chosen a Floral Theme for us, and being the flower girl that I am, I knew I couldn't let that pass without throwing my hat in. I loved the pretty coral flowers in our inspiration photo, so I pulled out some inks that I thought would work and my Papertrey The Sweet Life 3-step roses and had a play. My original idea was to make a clean and simple card, one layer, with the flowers in the top left corner and a sentiment below them. I spent a good amount of time stamping and masking my rose and fern bouquet, and then I stamped my sentiment. Wouldn't you know, it was not straight. I really need to get myself an acrylic block with grid marks on it - anyone want to recommend a good one? So I decided I'd fussy-cut the stamped flowers and redo the card as I had planned, but popping them above the card this time. At some point my mind remembered this lovely old remnant of vellum in my collection of papers, and sure enough, the colors are great together. So my design morphed a third time to this final one. I stamped my sentiment before attaching the vellum panel, then popped the flowers above and added some pearls to match. Would have liked to use the trendy sequins, but my colors are still too limited........and I still love my pearls. We're supposed to categorize our creation, so I'll put this one into Clean and Layered. These roses are so fun to stamp - wish more companies would do 3-step stamps for us! Enjoy the rest of your weekend! Is spring on the way yet? I used Simon's Small Love You, Large Hearts set, and Small Doilies dies, and the tiny trio of stamped hearts is from their Just a Love Note stamps set. The washis are a set of 3 from My Mind's Eye called My Girl, with the addition of the clouds and hearts one, and the twine is Doodlebug Ladybug doodle twine. There's also a little Hero Arts red heart pearl on the bow. Of course there will be prizes, so make a card using at least 1 die, from any company, and enter it in our challenge HERE to be eligible, using our keyword LOVEFEST2014I. Simon Says Stamp will give a $25.00 gift voucher to the winner of our challenge, and another $25.00 voucher to someone who has participated in every challenge throughout the event! You have until March 3 to enter. When I saw that one of the suggested trends for the Wplus9 Trend Watch challenge was stripes, I got right to work making this card. I have always been drawn to a striped pattern with a floral border beside it, so that's the direction I went. I have had these Fresh Cut Florals stamps and dies for ages but have been intimidated using them, as they are everywhere in blogland, and I felt I had nothing unique to offer. So these stamped and die-cut images were just waiting for me in a little plastic bag where I had set them aside after making them. This time, after stamping the stripe in pink and adding a Martha Stewart doily edge punch, everything came together to my liking. 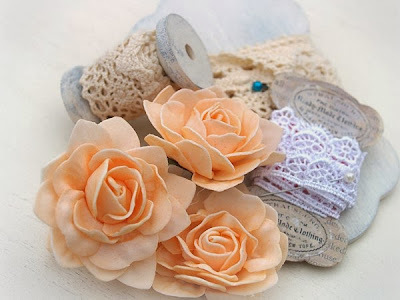 They are so much fun to play with and arrange in different ways - maybe I'll not be so slow to use them next time! Hope you like it too - thanks for visiting! It's Wednesday! Welcome to another edition of the Simon Says Stamp Wednesday Challenge! I used these Prima products: Fairy Rhymes 6" paper pad, Script Resist Canvas Flowers, wood buttons, and added my own lace and stamped sentiment. The canvas flowers are sponged with Hero Arts soft tan and spun sugar distress inks. (The leaves are paper die-cuts). I used worn lipstick to sponge the big flower and antique linen for the little one My leaves are old Hero Arts stamps stamped on sticky-back canvas in forever green mid-tone ink. The banner is from Lawn Fawn's Bannerific set, and the sentiment is from the same discontinued The Craft's Meow set as above, Side by Side. The big button is especially pretty, lovebirds on a floral background. As always, Heidi has provided another $50.00 gift voucher to the Simon Says Stamp store for the random winner of our challenge. It's week #3 of Wplus9's 4th Birthday Celebration, and this week we're to make something that showcases a current trend. I combined 3 trends in my card: the use of stencils and embossing pastes, vellum, and sequins. I started by tinting my modeling paste with bundled sage distress reinker, and spreading some across this Studio Calico Intertwined Circles stencil. While that was drying I cut a vellum tag, and white embossed my sentiment. I also stamped these Blanket-Stitched Blooms using bundled sage, spun sugar, and tumbled glass distress inks, cut them out, and centered each with a tiny blue sequin. I added Cupcake Doodle Twine to my vellum tag and attached the flowers, then added pink, clear, and aqua sequins before popping it above my card base. Wplus9 is giving away a very generous $100 gift certificate to a random winner of each week's challenge - hope to see you there! Thanks for visiting me today! ........with my quilt cards for the Cozy Quilt challenge at the Curtain Call Inspiration Challenge! I evidently miss my quilting days, as I have embraced this challenge. I haven't done an all-stamped card yet, so here's one, using a complementary color scheme. Adirondack Sunset Orange and Hero Arts Tide Pool inks, a Hero Arts/Archiver's sentiment, and lots of pearls. This one was inspired by a Pinterest photograph that I have had on my boards for quite awhile. The pattern of pointy edges is called Prairie Points, and is usually used on the edges of a quilt, making kind of a ruffle all around the border of it. These papers are from various places: BoBunny dots, an old blue gingham that I've had forever, and the florals and the sentiment are from the Simple Stories Summer Fresh pad. The red ric-rac is from my sewing basket. It's snowing again this morning - looks like we're in a slow-motion snow globe here; the flakes have been gently falling since we got up. Gives everything a nice clean look again! So of course, I'm still playing with Curtain Call's Cozy Quilt challenge. I found the neatest tutorial to make this Pinwheel Pattern, and it's really fun and easy! Thank you, Darlene! My papers are from Pebbles Family Ties, and I added a yellow enamel dot to the center, and did some faux stitching around the edges after placing it on my card. The sentiment is Hero Arts, stamped in their pool ink, and the embossing folder I used is Cuttlebug's Wicker Weave - the dimensions worked perfectly! For my 2nd card, I revisited a pattern called Rail Fence that I've done before. It occurred to me that instead of cutting out lots of strips of paper, I could achieve the same look with washi tape. As I often did when I was making a quilt, I let a particular pattern be the source of choosing all the other ones. In this case, the brown is actually a fabric tape. The others are various regular washis. I embossed this with a big 6" Crafter's Companion Dot embossing folder. I centered the whole thing with a Chrissy and a Leanna butterfly die from Simon, and added a button candy dot from Pebbles. Thanks for visiting me today - hope you're keeping cozy! I started playing immediately and came up with 2 cards today. This one uses papers from various October Afternoon pads, cut into 1" strips, and then pieced together to form this pattern. One of the reasons I enjoyed quilting so much was putting together fabrics that looked well together, and the same holds true for this medium as well! I started with the little floral piece, and pulled papers that went with it This tiny sentiment from an old Hero Arts SparkleClear set is perfect, and I added some of my favorite stamped flowers, centered with a glittery heart sticker to go along with the sentiment, and some die-cut leaves. After piecing my little quilt and before attaching it to my card base and adding the embellishments, I ran it through a Darice embossing folder called Simple Interlock to give it that dimpled look that quilting gives. My next card was much simpler, utilizing a designer paper from Jillibean Soup. I found cardstock to frame it up and then embossed the whole thing with a Cuttlebug embossing folder called Houndstooth. Again, the sentiment is Hero Arts and seems appropriate for a quilt card. Those little stars are stickers from an Oh Deer Me Kit that I won from Jennifer McGuire's blog last year. 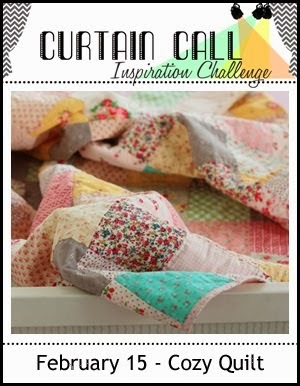 If you are a quilt lover in any way, don't miss the beautiful sample cards that the design team made for this challenge! We have 10 days for this challenge, and I know I'll be playing again! 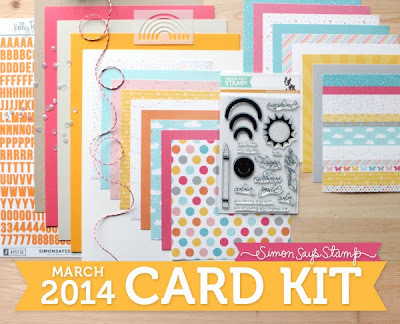 Here's a card I made with the new Simon Says Stamp March Card Kit. Aren't the crayons fun? I used the new cardstock that Simon recently started making (island blue, sunshine, green apple and orange peel), plus the pink cardstock from the kit to make my bundle of crayons, then tied them together with the included twine. The background orange is one of the Lawn Fawn Hello Sunshine design papers that are in it, too, and my sentiment was pieced together using some of the phrases in the stamp set. My banner is a die from Simon's Sketchy Banners. This is JUST what we need at this dreary time of year! It's week 2 at the Wplus9 4th Birthday Celebration, and the challenge this week is called "Step It Up". We are to create something and make sure it has dimension. I took this challenge at its word and lifted the whole front of the card up, allowing the die-cut word to be revealed against the print background. And the added sequins give a little more dimension and sparkle. supplies: Doodlebug Designs Bubblegum Dot design paper, Wplus9's Seasonal Sentiment die, Heidi Swapp Confetti stencil, Picked Raspberry distress ink, clear and pale pink sequins, and LOTS of adhesive foam squares to lift my panel above the base. Getting this in just under the wire for the deadline - thanks for stopping by! Welcome to another edition of the Simon Says Stamp Wednesday Challenge! 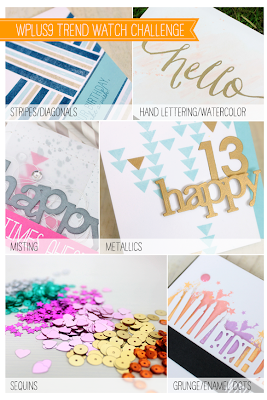 Our challenge this week is to get krafty: use kraft cardstock or color on your entries! The design team are playing with Memory Box products this week. Here's my first card. I used these Memory Box dies: Grapevine Wreath, cut apart and reformed to form a fat heart, and Fancy Blossoms. My sentiment is from Simon's Just a Love Note set, stamped in Hero Arts Latte ink, and the paper is from Doodlebug Design's Sweetheart pad. I love the little kraft grid with the tiny hearts sprinkled throughout! At the very end I added a natural twine bow and a Hero Arts pearl heart. And here's another, using the same wreath die, stamp set, and paper, but adding the Perched Reed Bird die and some hearts. Heidi has contributed another of her $50.00 gift vouchers to the Simon Says Stamp store for the lucky random winner of this week's challenge! I had an immediate reaction to Therese's card at the new Muse challenge when I saw it this morning. Isn't it amazing? I love the way Therese used distress inks to watercolor these amazing flowers, and I love the colors she chose. My mind went immediately to these Memory Box stamps (Gorgeous Bloom and Gorgeous Mini Bloom) that I was given by a sweet friend last year, and stamped a panel of them. After allowing my ink to dry completely, I took my distress inks and those little finger daubers and colored the panel in. I then spritzed it with perfect pearl water, and dried it, and then I lined it with thin strips of Simon's new Green Apple cardstock, and attached it to a white card base. Then I thought I'd try running the front of the card through the Anna Griffin Poppy embossing folder, as the big frothy flowers on it are quite similar. And I added a banner with a sentiment from Sending Smiles Messages, and 3 enamel dots. Thank you, Therese, for your beautiful card! I found this pretty Bella Blvd button at Archiver's before Christmas, and thought it would make a pretty center for this flower, so I went looking for papers that would complement it. I found them in pads by Simple Stories Vintage Bliss and Echo Park's This & That. This old sentiment from Thoughtful Messages works perfectly, and I updated it a bit by using a MFT Petal Pattern stencil and modeling paste for my background. When everything was dry, I added red pearls to the centers of the stencilled flowers. Thanks for visiting today! We had more snow this morning, and everything is clean and white again! Have been enjoying watching the birds at the feeders. Looking forward to Downton Abbey this evening! 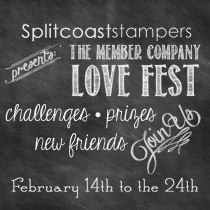 I'm entering this into the Splitcoast Stampers challenge for Valentine cards. I used my Heart Flowers die and a variety of Doodlebug Designs papers, a sentiment from an old Archiver's/Hero Arts set called Heartfelt Wishes, an EK Success Scallop Diamond border punch, and a Sizzix Dots embossing folder. This is the Mood Board this time - it has all my favorite things! 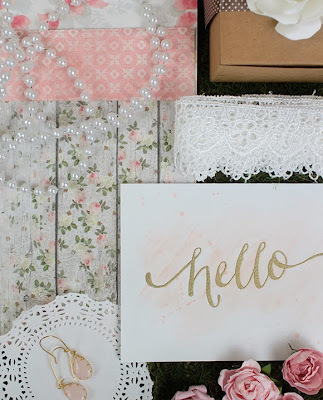 Soft pink, pearls, doily, lace, just lovely! I knew just what I wanted to do! I started with this paper from My Mind's Eye Bramble Rose, and the flowers reminded me so much of the blanket-stitched flowers from Blanket-Stitched Blooms. So I colored up a few, put them on a Spellbinder's Floral Oval, added some pearls to their centers, and gold-embossed a sentiment from the same stamp set. Couldn't resist adding this gingham ribbon, as the color works just right! Love how this came out - it makes me smile - hope it does the same for you! Thanks for visiting me today!